as we are now into the last couple of weeks before SHOTORAMA, a quick reminder to ALL DAN GRADES, southern region or not, KUGB or not, that we have a great program for you and hope you’ll join us (sign up: shotorama.com)! in our previous posts you can read all about our instructors, including some of the feedback from their students: “classes are packed with a fantastic level of technical detail”, “a unique teaching approach … I highly recommend….”, “the most supportive and awesome sensei”, and much more! and did you know we have former world champions, former kata squad members, former kumite squad members, southern region champions, and instructors with over 40 years’ experience in the line-up? our dan-grades only workshops are perfect for advanced training, including specific focus on kaeshi-ippon kumite, dan grading preparation and feedback from some of the southern regions most senior instructors, and/or the chance to stretch yourselves with advanced kata and kumite topics! shotorama.com. sign up now, and we’ll see you there! Chris was one of the first instructors we asked to come on board to SHOTORAMA, and also one of the first to agree, and so we are grateful to him for showing such enthusiasm for the project, and helping us realise that our plans could become reality. Chris will be a familiar face for everyone in the southern region, but here is some more about his background and influences. When did you start karate, and how long have you been training? I started training in 1994 when I started my teaching degree at Canterbury Christ Church University. What club are you at now, how did the club get started, how long has it been running? Shiseikan SKC in Maidstone. I started the club 9 years ago, after a bit of gentle persuasion from Sensei Poynton, and to enable my son to train. Have you tried/ do you have experience in other martial arts? Only a taste through my own senseis: a hint of tai chi, judo and aikido. Who have been your major influences/instructors? My biggest influence by far has been Sensei Georges Dussart at Canterbury; I view him as my “karate dad”. I’ve always found his teaching inspiring, fun yet challenging… and there is a spiritual aspect to his karate that I’ve not experienced with any other instructor. How would you describe your philosophy/attitude to karate? Try your best always, aim to take something from every session. What experiences from outside the dojo do you bring to your training/teaching? How does karate influence your life outside the dojo? Massively! The ability to stay calm and focused in trying times is a huge benefit. What is your favourite part/aspect of karate training? The camaraderie. The fact that you can basically be warring with someone one moment, bow and everything is friendly, even if one of you has battered the other. I have made so many friends through karate. Do you have a favourite exercise/drill/kata? How would your students describe you/your lessons/club? I don’t know, but they keep coming back. I’ve barely advertised over the past few years, but the club has more members now than ever! What challenges/ambitions do you have? Do you have any particularly memorable highlights of your karate career (so far)? As a competitor – Runner up in the veterans’ kumite in the Southerns. Having the opportunity to compete against people such as John Bruce, Chris Cray and Hisham Saif. As an instructor – Seeing my students, from both Canterbury and Shiseikan, earning trophies, medals and new belts (especially black belts!). Watching Holly Sterling achieving all she has achieved. I had the pleasure of instructing her and her sisters at Canterbury for a short time when she was in her mid-teens (she was a higher grade than me, even then.) I don’t think I can claim to have had a major influence on her path in karate, but I am proud to have played a part in her journey. Sensei Dave Graham is the most senior of our instructors on the SHOTORAMA line-up, and is a well-known presence in the KUGB and in the southern region especially. He has his own profile on the KUGB instructor’s page, so check that out also for more details on Dave’s background. 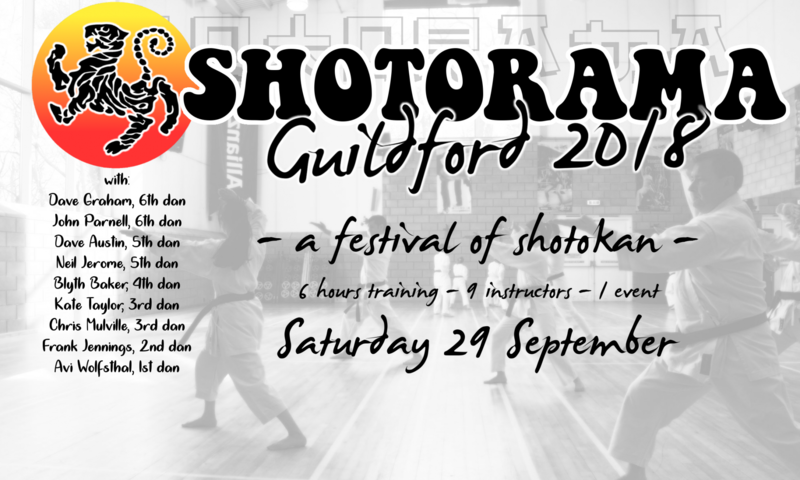 To train with Sensei Dave and all of the other SHOTORAMA instructors, remember to sign up soon! This not a simple question to answer as my attitude has evolved over the years, in the early days it was train hard, be tough, sweat and virtaully die for the cause but then as I moved up the grades especially around 2nd Dan time the realisation came that there was more to karate than physical strength but strength of mind and character plus maintaining a high standard. Frank is another one of our southern regioners who made the move from training into teaching after finding himself without a local KUGB club; he now runs Senshi karate in London, actively cultivates relationships with other clubs and guest instructors, and particularly encourages families to train together. Frank’s friendly and easy-going nature makes him a very approachable instructor, but don’t underestimate his eye for detail and commitment in everything he does! We’re grateful for Frank for agreeing to join the SHOTORAMA instructors team, and apologise to his club members for taking him away from their regular Saturday session. Of course, the door is open for everyone here at SHOTORAMA! Here is some more about Frank and his background, with a couple of thoughts on what karate means to him. I started training in 1996. I started training in London, moved to Liverpool where I continued training and then moved back to the South East. At that point, I switched associations for a while, but came back to KUGB for the quality of karate. I run my own club, Senshi Karate, in Greenwich and Charlton in South East London which I set up in 2016. I set it up because there were no KUGB clubs in the area and I was keen to fulfil the promise I made to my daughters and get them to black belt. I’ve got one there so far. The other is not far behind. I also train regularly at Marshall Street in central London which was Sensei Enoeda’s old dojo. I tried Jiu-Jitsu when I was a teenager. It was good fun – particularly the throws and breakfalls – but ultimately, I didn’t get on with it. Modern shotokan karate, of course, has similar kicks and punches but has lost its throws. I was influenced by sitting in front of the TV with my Dad watching David Carradine in TV programme Kung Fu (“Ah, grasshopper”). Then the (original) Karate Kid (“Pain does not exist in this dojo”) and of course Bruce Lee (“Become like water my friend”) who inspired a whole generation and beyond. In real life, Robin Dale at Ichiban in Crawley has been a key influence in my karate. And Sensei Rhodes, under whom I’ve trained many times and who has run several of the gradings at my club. The physical side of karate looks after my body, the philosophy or, if you like, the spirituality behind karate looks after my mind. You practise over and over, stripping out unnecessary movements to make it as natural, efficient and powerful as possible. You learn to hurt and try not to be hurt. And then you learn not to use karate unless you have to. And be nice to people. It’s not a bad code to live by. I try to make my classes fun. Not everyone appreciates my sarcastic humour and my Dad jokes don’t always work. But explaining things through humour – especially when you’re correcting someone’s mistakes in front of the class – is my way of trying to get people to see for themselves and do it better next time without them feeling embarrassed. And I also tell them what I’ve done wrong and how I’ve learned from my mistakes. After all, we’re still all learning. Everyone loves kumite: it’s the glamorous side of karate. That’s one of the reasons I started karate and, at first, I couldn’t understand the point of kata. I thought it was a form of aggressive ballet and a waste of time. But, as I became more experienced, I started to understand kata better. In kumite, you have to use control so that you don’t (deliberately) injure your opponent. Kata, on the other hand, is a great opportunity for me to practise a more varied set of techniques without control. And when you do the bunkai for a kata, it all makes sense. The first time I did bunkai training with Sensei Rhodes was a light bulb moment for me. My current favourite drill is kizame tsuki, gyaku tsuki with yori ashi. Simple. That’s me! Current favourite katas are Tekki Nidan and Gankaku. However, I also enjoy practising bunkai sequences from the Heian kata. I run my club in conjunction with my two daughters who also do karate. There are a few fathers and mothers who train with their children at my club and we have a 50/50 split between male and female students. Hopefully, all this means that my students would say they find it a family-friendly environment in which to train and they learn while having fun. I started karate later in life and will never be world champion, get to 8th Dan or be able to do full splits. However, I want to get as far as I can while the body still lets me. I also want to see my students do well and start passing on what they have learned. As I said, I started karate later in life and, while I have won some medals in my time, I don’t compete much. For me, therefore, it’s about improving my karate and pushing my students to achieve their best. I’m particularly proud of setting up my own club and, through the club, getting my oldest daughter through to black belt, the first person to do so through my club! I think I’m going to be the instructor who is travelling the furthest to come to SHOTORAMA, living in Norway now, but it has been amazing to be at the heart of the event planning form the start, getting our friends on board and working to make such a unique event. Anyway, here’s some background on me. i started at university; later than i would have liked in hindsight, but any age is a good time to start karate! here’s a question for anyone thinking to start training: if you start training now, do you know how old you’ll be when you get that black belt? and the answer is: the same age as if you don’t. i started kenmei while i was working in london, about 8 years ago. it closed a while after i moved to norway, but i’m super proud of everyone who achieved so much and made the club what it was while it was running. i’m still attached to clubs in the uk, and always try to get into a dojo when i’m back over. i’ve tried so many, but all while training shotokan! i’ve tried ju-jitsu, wing chun, capoeira, aikido, iaido, tai chi. maybe some others. some other styles of karate too; wado and shito-ryu. i took judo long enough to get a few belts. and they were all brilliant, and opened my perspective no end. but i always returned to shotokan; shotokan contains everything, but it is important to get external in help finding the things you’ve missed. i trained in manchester and salford with garry harford until nidan, and am definitely a product of his outstanding teaching. but i have trained with so many others, in the KUGB and other associations and around the world, and the best teacher is experience, both depth and breadth. a major influence has been the lessons learned from fellow students, club instructors, and training partners over the years, and it is definitely this that led into the idea for SHOTORAMA. good question! definitely to be open to new ideas and interpretations, and to question everything – not in a disruptive way, but to search internally for the feelings of movements, to play around and explore variations and see what is valid and where the scope of a technique ends. because your karate will be different to mine, and anyone else’s. and to remember that efficacy is the only metric that matters – aesthetics is tied to that, via efficiency and body mechanics, but is not a goal in itself. um. everything?! i have a background in science, which helps in analysis, communicating ideas, and being constructively critical. spending time with other martial arts helps. one that’s less obvious is that i learned so much from doing improv comedy that i would often incorporate those principles into my lessons in a sneaky way. martial arts, and self defence, are ultimately about understanding and negotiating the interplay between people; it’s important to give the non-physical side of that its full weight. too many ways to describe! i’m fitter, happier, and more productive. i just really love training, and teaching especially. that sounds dumb, but its true. when i go to clubs where the instructor doesn’t seem to have any passion or joy for karate, it’s no surprise that the students don’t either. my favourite part, then, is when people show up! being able to teach and train with other people? it’s the best! from day one at my club, and at every lesson i teach, i have always said thank you to everyone for coming. that changes constantly – its always whatever i’m thinking on at the moment. training under new instructors always throws up something new, interesting, and challenging. my long-standing karate buddy paul, also from garry’s club in manchester and who dropped by my club once it was up and running, described the style as ‘weirdly articulate’. i’ll take that. currently, i’m learning to teach in norwegian, which is a fair challenge! and keeping in touch with uk clubs and friends is important to me. the idea and organisation of something as big and complex as SHOTORAMA has been a big deal. we didn’t just want to do another training session; you’re going to see something special. i tell too many karate stories. just one? ok! i vividly remember a session in manchester, years ago, maybe i was shodan at the time. a rotating partner drill with simple block and counter for gyaku-zuki. i was up against stuart gordon, who outclassed me in basically all aspects, and who was definitely a strong influence on my karate development. anyway, i went for him full acceleration, and got him. i don’t know who was more surprised! and i saw this very brief look in his eye, like he knew he’d been caught napping. of course then he immediately stepped up and was beating me easily. but it was great to realise that in that moment at least, i was an opponent who shouldn’t be underestimated.